The Back Shop Memory Mattress, made from visco elastic, a revolutionary new material, is the ultimate in mattress technology. Visco elastic is a special memory material that responds to body heat, softening at points of high pressure, collapsing, then distributing the pressure over the surrounding areas. Slight movements of the body allow the collapsed areas to recover. They remember their original position and once more take up pressure. The cycle is repeat continuously. Back sufferers using the Memory Mattress immediately discover that the number of times they change position body positions throughout the night, in order to relieve aches, is very much reduced. As can be seen from the drawing The Back Shop Memory Mattress consists of two layers. The top three inch layer is made from visco-elastic (commonly called memory foam). The bottom is a seven inch layer of pocket springs. The number of springs varies with mattress size. For example a five foot mattress has 1,500 springs. The springs improve ventilation and prevent rolling into the centre of the mattress. The also provide bounce, allowing the body to more easily shift position. Mattress sizes are 3 foot, 4 foot 6inches, 5 foot, and 6 foot. The drawing illustrates how the visco-elastic pressure relieving top layer works. Lying on your back results in the mattress slowly attaining body heat, softening, allowing you to slowly sink into the mattress, until eventually it takes up the exact imprint of your body. Your bottom and shoulder blades sink into the mattress thereby guaranteeing correct support for your lumbar and upper spine. Similarly lying on your side the hips and shoulders sink in, giving lateral support to the spine. Another characteristic of visco- elastic is that it immediately collapses when pressure is applied. This can be demonstrated by placing a large bunch of keys on the mattress. Sitting on the keys causes the mattress under the keys to immediately collapse resulting in the keys sinking into the mattress. The person is totally unaware of the keys being sat on. The practical application of this is that where bony parts of the body (ankles, heels, knees, hips, elbows, shoulders, shoulder blades) touch the mattress it immediately collapses. Pressure, the main cause of bedsores, aches and pains, is removed from the joints and distributed over adjoining areas of soft tissue. Mattresses are available in all sizes. The mattress cover is easily removable for cleaning. The Back Shop Mattress comes with a 5 Year Guarantee which means that if it fails within this period it will be replaced free of charge less the cost of carriage. Choosing a mattress can be extremely difficult. The normal procedure is to lie on a mattress for several minutes and then make a decision either to buy or not to buy. Determining the suitability of a mattress requires a number of night’s sleep. Many people then realise they have made a bad choice. It is then too late. 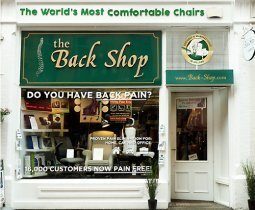 The Back Shop, aware of the difficulty, sells the mattress with a two month money back guarantee. If at any time within two months of purchase you are not satisfied we will refund the cost of the mattress less the cost of carriage. The Vacuum Packed Mattress is eight inches deep and consists of a two inch layer of visco-elastic on top of a six inch layer of 1,000 pocket springs. As the name implies it comes vacuum packed. This technique results in the overall mattress thickness being reduced to approximately two inches, allowing it to be easily transported and delivered in lightweight rolled form. Removing the airtight covering results in the mattress quickly expanding to its full eight inch thickness.